Most interviews with up-and-coming rappers don’t take place in Brooklyn religious learning centers. But DeScribe isn’t your typical rapper. The 28-year-old hip-hop artist, who recently released the single “Pure Soul” and has an EP coming out in June, doesn’t wear gold chains or rap about fast cars, loose women and expensive booze. That’s because DeScribe (real name Shneur Hasofer) is an observant, Hasidic Jew. Born and raised in a Chabad Hasidic family in Australia, DeScribe’s message wasn’t always so positive. He moved to Jerusalem when he was a teenager and joined the Israeli army as a sharpshooter. Once out of the army, DeScribe says, he lost his way. Scared, penniless and without a home, the bearded artist had an awakening. So he moved to Brooklyn to study with the elders at a yeshiva in Sea Gate, where he discovered hip hop as a form of expression. DeScribe convinced the rabbi to allow him to build a studio in the yeshiva and he started laying down tracks. His fellow yeshiva students loved his music, but his career did not take off. His big break came when the Israeli media picked up on one of his music videos in 2008. He can no longer walk the streets of Jerusalem without being mobbed. Suddenly, DeScribe was playing the Highline Ballroom with Perry Farrell, the front man for Jane’s Addiction, and collaborating on songs with Bob Marley’s son, Rohan. But the young artist was still perfecting his craft. Three years later, DeScribe has come a long way. He not only is comfortable with a mic in his hand, but he takes both voice lessons and dance lessons. 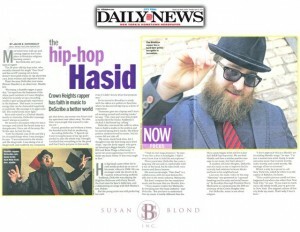 His most recent single, “Pure Soul” is a collaboration with the most famous Hasidic Jew in the music industry, Matisyahu. But don’t compare the two musicians’ music just because they are Hasidic Jews. A resident of Crown Heights, DeScribe uses his music to try to improve the historically bad relations between blacks and Jews in his neighborhood. Last year, the music video for his song “Harmony” was promoted as “a groundbreaking tool for unity and racial harmony” by Brooklyn Borough President Marty Markowitz to commemorate the 20th anniversary of the Crown Heights riots. For DeScribe, music is not about religion. Which is why he is proud to call New York City, which he refers to as the capital of Babylon, his home.